Hello, Dear Bloggites! 🙂 I have a non-fiction book review for you. This review is for the book Rachael, Did You Know? by Veronica Sites. I have had the pleasure of spending some time with Veronica and experiencing a seminar or two. One of the greatest enjoyments I received during these seminars is watching Veronica do what she loves best: sharing her love of Christ and helping make a difference in people’s lives. Rachael, Did You Know? is about coping with the traumatic loss of a close relative and how turning toward Christ can help you through the grieving process. Rachael is a young teenager that Veronica helped encourage and mentor at the time she lost her brother, Stephen, unexpectedly due to a car accident. The book is also Veronica’s testimony about how this young girl helped her find her calling in ministry as a chaplain. Dealing with a traumatic loss of any type leaves a deep, painful hole in a person. Each person grieves differently and this book is a great tool to help strengthen your faith in Christ or help you turn to Christ as your Savior. 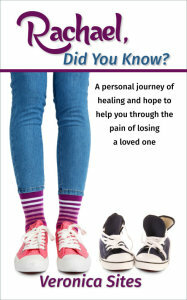 Veronica Sites provides some great tools to use to help cope with your feelings of loss in Rachael, Did You Know? One of the cool things I noticed while reading this book was each new chapter started with, “Did you know…” as if the author is speaking to Rachael or more specifically, the reader of the book. It made me smile each time I read the titles because I could just imagine Veronica talking to Rachael saying those words. You, Dear Bloggites, know me, and anything that helps get my imagination juices going is a true joy to read. Throughout the book you will read many passages from the bible that the author wants you to reference in regards to the topic she is writing about as well as pages to do mini-exercises and journaling to help you cope with the loss you are feeling. Each person has their own unique way of mourning but most have a hard time putting into words what they are feeling or figuring out the next step to cope with their emotions. This book helps provide steps to cope with the different stages of grief with the underlying understanding that they will come out of their grief a better person and a future mentor for others that will cross their path. I am always saying that “only you can be the best you out there and no other can come close.” This book has that same context of being a special person with a purpose in life. A purpose that is meant to be a light to all who have the pleasure of entering into his or her life, be it a short-term or long-term time. No matter what your religious belief is, I promise you will find comforting passages and great tools in this book to help cope with whatever is troubling you. Even though this book is mainly for coping with the loss of a loved one, it still has little pearls of wisdom that you can take and incorporate into all struggles you may have in life.